Helen Matondo is 13 years old. She's in her second year of high school and dreamt of one day becoming a church Minister or maybe just a beauty therapist. Now she just dreams of survival. Three-and-a-half months ago she refilled a kerosene lantern in her grandparents' village home where she lived. As she lit it, it exploded, covering her with liquid fuel. Helen leapt away, seemingly unscathed. The curtains caught fire and a neighbour rushed in to help. He pulled the curtains off the rail, to try to prevent the house from burning. As he threw the curtains, they touched the fuel-drenched girl and she caught alight. Her cousin Sabelo (15) died on the scene. Sibling Kubasango (19) survived with minor injuries. But Helen has 42 per cent burns etched across her stick-thin body. Chest, torso, arms, legs are raw, infected. 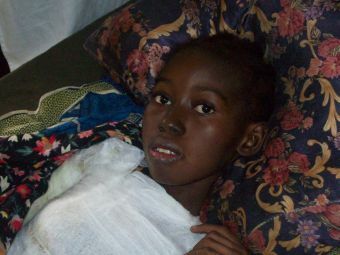 Just her pain-numbed face is saved. 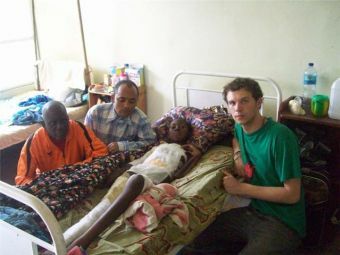 She was taken to the Centre Hospitalier a' Etat Banana where she was helped by Dr James Lee Carlo, a Congolese general surgeon who'd learned some burn care at the Cliniques Universitaires de Kinshasa. Helen lay there, losing weight that her beleaguered body could not afford to lose. Then on Sunday night her grandfather Manianga Tuka (59) turned on the television.